PENNINGTON GAP, VA—Taking pains to ensure the returning citizens feel as normal as possible, government representatives confirmed Thursday that the Americans recently freed from North Korean prison will be put into U.S. detention camps to help ease the shock of their return to Western society. 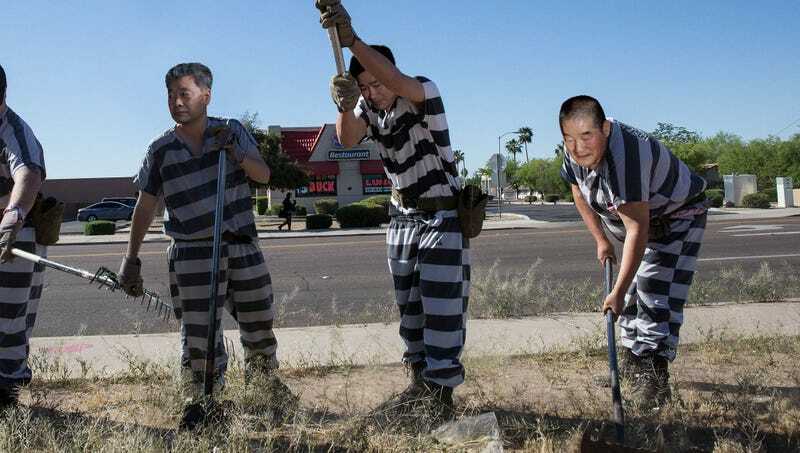 “In light of the months they spent in a brutal North Korean work camp, we thought it would make their transition home easier if they spent some time picking crops and paving roads as American prison labor,” said administration spokesperson Dara Zaleski, explaining that all three freed prisoners have been shipped to Lee Correctional Facility to alleviate the adjustment to American society by doing manual labor for 90 cents an hour. “After a 12-hour day of hard labor while being exposed to the elements and subjected to constant humiliation by prison guards, they’ll eat gruel barely fit for human consumption, spend some time in solitary confinement—anything to help them adapt to an American environment. Coming back to the U.S. can be a big culture shock, but fortunately, this country has no shortage of facilities that will make them feel like they never left North Korea.” Zaleski said that, assuming the prisoners maintained good behavior, they were expected to be paroled and returned to their families within the next five to seven years.